Most people today have been deceived--everything from divorce to the true meaning of love, from healthcare to AIDS, from religion to the Bible, from the stock market to the economy, from homeland security to world events, from 911 to Iraq, etc. You name it! The reason is because most people are sinfully foolish, and love not the truth, "...because they received not the love of the truth..." (2nd Thessalonians 2:10). They choose to remain ignorant of the truth, "For this they willingly are ignorant of..." (2nd Peter 3:5). The Bible teaches that many people choose to remain ignorant. However, ignorance is no excuse of God's Laws. Most people are foolish, loving their sins, and lack the desire to find the truth. 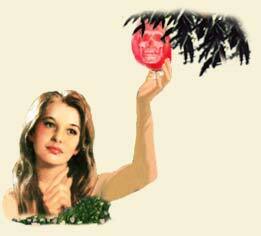 Eve sincerely ate of the forbidden fruit in the Garden of Eden. She sincerely thought that she would be equal with God when she ate of the fruit. Eve was sincerely WRONG! This is so important to understand. Just because something may seem right, doesn't make it right. Doctors have proved this point as much as anyone. As recent as a couple centuries ago, unorthodox doctors were laughed to scorn and persecuted for the practice of washing their hands continually, before and after surgery. The medical experts of that day saw no benefit in washing one's hands. They couldn't have been more wrong! Today, you can't even get a job cooking without agreeing to wash your hands extensively while preparing food, let alone operating on someone. Mankind has OFTEN been proven wrong. As we read in Proverbs 14:12 and again in 16:25, there are certain ways that seem right to men; but they are the ways of death. Eve learned this the hard way. Carefully notice, Eve had been given some HEATHEN ADVICE. The serpent had effectively brainwashed her into doing something very wrong. So many women today are just like foolish Eve, who listen to Satanic advice, and destroy their own marriages. Eve was sincerely deceived by Satan; but she was still GUILTY, and had to suffer the consequences of her foolish actions. Eve was punished. Eve was deceived because she focused upon her own selfish desires, rather than upon the will of God. This is where we all go astray. Eve was sincere in her rationale; but she was greatly DECEIVED. One of the greatest areas of deception today is divorce. I am sickened and saddened every time I hear of another divorce. Divorce is a sin, and God hates it (Malachi 2:16). There are NO Biblical grounds for divorce. But you say, "Wait a minute! Didn't Jesus permit divorce in cases of adultery?" Do you mean to tell me that God expects you to remain married to a bank robber or murderer; but it's ok to divorce for adultery? That doesn't make sense at all. Don't tell me that Jesus would permit a divorce in cases of adultery; but not for murder! What if a husband is sentenced to life in prison? Does his wife have Biblical grounds for divorce? Absolutely NOT! There's not one verse in the Bible freeing a wife from her husband if he's been imprisoned (or vise versa). I realize this is a hard pill for some to swallow; but "'Til death do us part" means what it says. You made a promise to your spouse on your wedding day! I feel sorry for a man who is sentenced to life in prison, and then his wife divorces him and moves on. How cruel. God promised in Hebrews 13:5 that He would never leave us not forsake us, and that promise is unconditional to all who have been born-again in Jesus Christ. So if God never abandons His own, then neither should we! The wife, or husband, who abandons their spouse is guilty. Spouses aren't pets. It is disturbing to realize that there are people who would do anything for their pet; but not for their spouse. It's a sin unto God Almighty! Sadly, most people don't marry for love anymore; but for selfish agendas. When the going gets tough, such selfish cowards abandon. America today has been infested with feminism. The results have been disastrous to marriages and families. Feminist thinking has infested women's organizations, shelters, churches, the court system, mental health care providers, etc. The natural consequences is a greatly elevated divorce rate. Such feminist organizations attempt to castrate the Biblical husband of all his power and authority over his own wife. God says that a husband is to RULE over his wife (Genesis 3:16). Wives are increasingly becoming resentful to such Biblical teachings because of sinful feminism. Feminism is of the Devil. God hates feminism. Along with women's lib, we have experienced the rise of lesbianism, abortion, prostitution, child molesting, indecency, witchcraft, and New Age in unprecedented levels in society. Women nowadays don't even think twice about taking most of their clothes for strangers to see. The results have been disastrous on American society. We are living in a modern Sodom and Gomorrah. The home has radically changed from 50 years ago. The family dining table is gone, and TV dinners are the norm nowadays. We have become a fast-food society. We now live in a push-button society--flip a switch, push a button, turn a knob. Ironically, all these modern conveniences have stressed out the American family--because we have nothing meaningful to do anymore except work to pay the bills. The monotony of going to work in a factory every day is unhealthy on the human mind. The days of working in the field are gone. Now people have to pay to exercise at a health club. Families spend less and less time together anymore. We need to get back to families staying together--no matter what!!! Don't be deceived by some feminist homewrecker--NEVER divorce your spouse, NEVER abandon your family, and NEVER disown your children!!! Anyone who encourages otherwise is your enemy and a liar! You won't be happy. There's a LOT of feminist homewreckers out there. Is your marriage next? The average "Christian" wife is saturated with feminist thinking and doesn't even realize it. I know a Christian man who married a Christian woman. He thought his wife would never abandon him, or divorce him, because she was a Christian. After 20 years of marriage, she abandoned him and the kids, and then divorced him a few months later. The wife had been brainwashed by some feminist "friends," including a feminist Baptist pastor's wife. Isn't it amazing how some well-meaning pastor's wife can help break up a marriage, hurting a woman's husband whom she's never even met? That's feminism folks! It's easy to hurt people you don't have to meet. That pastor's wife ought to be arrested and imprisoned for malicious behavior. God hates meddlers who separate couples, stir up strife, and destroy families. Divorce is a sin, and the wife who is DECEIVED into believing that she has a Biblical right to do so, will be found GUILTY at the Judgment Seat of Christ. I could tell you of hundreds of deceptions; but then I'd be sharing my entire website with you. I ask that you look through my website, and learn the truth about many different things. As you will quickly learn, we have been lied to about so many things. I wanted to focus specifically in this article on the deception of divorce. So many people are coming to the erroneous conclusion that it's ok to divorce. It is not! It doesn't surprise me that many pastors and ministers would recommend divorces nowadays, considering that many of the same ministers are condoning homosexuality, witchcraft, immodest dress, dancing, gambling, etc. I know of a Lutheran minister in Illinois who organized, collected the money, and drove his congregation to SIN CITY Las Vegas! What a shame! He's a sinister minister, not a pastor. These are the type of imposters who recommend divorces. No sir! Divorce is wrong! We are living in a generation of quitters! Every married couple ought to make a martyr's commitment in their heart, i.e., I will die before I will forsake my marriage vows. It's high time for this weak-kneed generation of spineless quitters, liars, and bellyachers to get tough, and hang in there! So that we may each say with confidence ... Come hell, wind, or high water--I'll never forsake my God, my children, or my marriage!